Sean Dyche pointed to young wideman Dwight McNeil as a major pluspoint on a disappointing day at Manchester City. Burnley exited the FA Cup at the Etihad for the second-successive season, losing 5-0. But McNeil, in his sixth-successive start, again didn't look out of place in such exalted company. Dyche made seven changes to his side to rest players with knocks ahead of Tuesday night's trip to Manchester United, and next Saturday's home clash with Southampton, and handed starts to Nick Pope, Steven Defour and Stephen Ward as they continue to build up their gametime after injury. And, asked of the positives on an otherwise miserable afternoon, Dyche said: "Dwight McNeil, Popey, Steven getting through the minutes he did, the ones who haven't played getting minutes. "We had to use the game - we had no choice, we are missing players again, had to piece the side together a side as best we could try to make sure players are back for Tuesday - but we're not sure they will be, but they've got a chance. "Then it's risk and reward, and the risk is, if they turn up as they did - they were terrific, they pounced on every mistake. "Virtually every goal from us making a mistake, and when they're in that mood, they hurt you. "You end up disappointed but there'a a reality to it. "But Dwight is growing all the time, he has ability and willingness to show it, an inner bravery. "I love that in players, it's a different kind of bravery. I had throw my head at it and block things bravery, but he's got courage to have the ball under any circumstance, and that.courage to have the ball and that's a powerful weapon. "I'm really enjoying his performances at the moment." 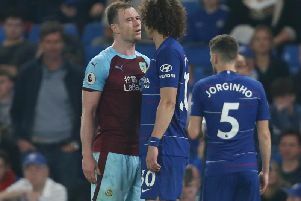 However, Robbie Brady, back after suspension, came off at half-time with a niggle, as Dyche explained: "That was the problem, at half-time, a sub down, with a mind to see if we can keep it tight, find the moments, but we had to change it, we had no choice. "Robbie has a groin injury, hopefully not too serious, and then we had a golden moment to go and score. "You don't get many of those at these clubs, not saying we'd have gone and won but it could have changed the feeling if he'd (Vydra) put it in the net. "Not remotely saying we'd have won but it changes the outlook of the game. and after they scored the second that changed the game. "I think that's their mentality, they improve year on year, their shape is good off the ball, not in a tackling way. they diffuse the game well, they're a top side. if you have a top side working as well it helps tremendously, work off the ball. there's a killer instinct without doubt. they're a top side." Dyche's squad is stretched, but chances of bringing anyone in before Thursday's transfer deadline look remote: "It's very difficult to balance the finance and get the players in, it's never ending and it gets more difficult, no one releases players easily so it gets more difficult. "Look at how quiet January is. there's teams everywhere looking - with more financial power - and they're not getting deals done either. "It's very difficult. we had to make decisions because we've a few touch and gos and they can't play because the Premier League is our biggest fight this season - can we continue to stay in the Premier League?"